6-CHANNEL TIMER from POWERBOX - ON SALE! - FREE Shipping! 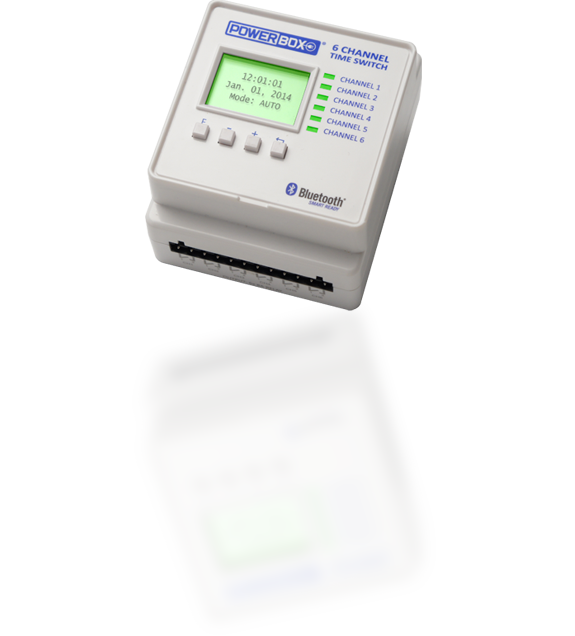 The all new POWERBOX® 6-CHANNEL TIMER California Trim Store is the most versatile timing device available anywhere!It can control six separate devices independently, from one synchronized time clock. An additional feature of this timer is that it contains BlueTooth Smart and there is an iApp so that you can control the timer from iOS devices, like iPhones and iPads, which makes it super-easy to program and operate. When we had the need for a high-quality, versatile and compact 6-channel timer for use in ourPOWERBOX® products, we searched the world and found it didn't exist! So, we decided to make it ourselves! World-class engineering went into the design of this product. Powered by an ARM processor and utilizing the most reliable and proven components, the 6-CHANNEL TIMER is very rich in features. Input voltage can range from 90VAC to 250VAC, so the timer can operate on virtually any type of standard grid power worldwide. There is a non-volatile memory backup, so the timer keeps its time and programs, even when disconnected from power for up to a year. Internal shielding prevents any RF interference from other electronic devices. Removable terminal blocks make wiring easy. DIN rail mountable for easy setup. LCD display for programming and status. BlueTooth Smart and iOS App for control from iPhone and iPad.